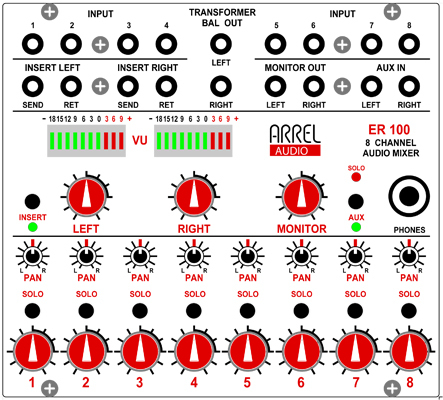 ARREL Audio Eurorack Stereo Summing Mixer is the answer to all stream mixing needs for EURORACK synthesizers. Its features set it apart from other similar products on the market due to a very high fidelity approach used for the design of the electronics together with the use of line transformers to drive the L and R outputs. The circuit used in the ER-100 are directly derived from our line of professional audio units in order to obtain the best sonic performances. The use of line transformers means a higher voltage output level (about 10 dB over the competitors), suitable to drive all modern audio converters. Output transformers mean also a very reliable connection in terms of unbalancing and ground loops problems. The ER-100 is characterized by 8 input channels and a stereo output. Each channel is characterized by a pan pot control, a volume control and a solo button. A stereo insert controllable by a switch is available on the output bus. The monitor section is characterized by a volume control and a monitor out. An auxiliary input is available (push button selection), suitable for monitoring DAC or general external inputs such us a CD. Two LED VU meters are available on the output bus. High quality output line transformers means a lot of advantages especially when used in the Eurorack environment such as: increase in the signal output level over the Eurorack standard level that is limited by the low supply voltages (+12V/-12V), no problems with ground loops (transformer galvanic isolation), no problems when the output will be unbalanced. Transformer galvanic isolation assure that the output signals are floating with respect to the ground so you can unbalance without problems. The possibility to unbalance the L and R output signals can be very useful in a lot of live situations. FAQ 1: Why the ER-100 is equipped with transformers on the line out L and R channels? Increase the signal output level over the Eurorack standard level that is limited by the low power supply voltages (+12V/-12V). Avoid any problem with ground loops due to the transformer galvanic isolation. Avoid any problem when the output will be unbalanced. Transformer galvanic isolation assure that the output signals are floating with respect to the ground so you can unbalance without problems. The possibility to unbalance the L and R output signals can be very useful in a lot of live situations. FAQ 2: Why the ER-100 is not a cheap equipment ? ER-100 uses two high quality audio line transformers on the L and R line outputs, high quality transformers are very expensive. The ER-100 is extremely compact. Please take into account that we offer, 8 channels, solo in place function, pan-pot, monitor out with high quality headphone amplifier supporting 50 ohm headphones, insert point, auxiliary input, and a flexible and accurate VU metering system. Implementing all these functions in the 28U format in about 40 mm of depth is a real engineering challenge. The unit is composed by 6 boards mounted over a motherboard so 7 boards in total so very compact and complex. All the electromechanical components (potentiometers, switches, push buttons and jacks) used in the ER-100 are of top quality. We know very well that these components are the most critical for reliability. Moreover whenever possible we use the concept of "Electromechanical Fault Tolerance (see KEY-TECNOLOGIES link ) to ensure very high reliability to our units. FAQ 3: What is the function of the auxiliary input (AUX IN)? The ER-100 AUX IN has exactly the same role as in a traditional mixer it is conceived as an auxiliary input on the Monitor Bus. This input is not added to the 8 channels. When you select the AUX IN you disconnect the monitor bus from the summing bus and connect the auxiliary in to the monitor bus in order to hear only the signals connected to this input. The typical situation is when you have to monitor a recording. If you want easily check the song recorded with your Eurorack synth you can connect the recorder output to the AUX IN and easily check "on the fly" the recorded song just by switching the aux in on position. At the same time, on the main out you can hear the mixed channels. FAQ 4: What is the function of the solo button? The solo button permits to listen only the channels corresponding to the SOLO button switched in ON position all the others channels are muted. So if you want to listen only channel four you have to select SOLO ON on channel 4. If you want to listen the mix of channels 2 and four you have to select SOLO ON also on channel 2. FAQ 5: Why there are no Control Voltages (CV) on the ER-100 ? Because ER-100 is a very high quality traditional mixer in the Eurorack format. It is characterized by the maximum transparency and linearity with very low distorsion in order to reproduce with maximum fidelity your sounds. The implementation of an amplifier or a pan pot controlled by a voltage means the use of VCAs (Voltage Controlled Amplifiers) or similar technologies that inevitably deteriorate the sound quality. ER-100 has not been conceived to be a "creative" mixer (in the sense of CV). ER-100 viceversa permits to the Eurorack user to have in his Eurorack case the power of a very high quality traditional mixer able to preserve all the sounds generated by the artist. FAQ 6: How the ER-100 INSERT works ? The stereo INSERT point of the ER-100 is connected to the main summing bus before the main L/R volume controls. You can easily use this stereo insert to connect whatever effect you want (compressors, EQs etc.) that works at line level. The insert can also be used for "on the fly" monitoring of a different signal source. To do this, connect the signal source output to the RETURN jack (the SEND jack is not used). The jack insertion disconnects the mixing bus from the L/R outputs and connects the alternative signal source to the L/R bus so can monitor whatever you want just by a jack insertion in the RETURN plug. FAQ 7: What about the ER-100 power consumption ? The power consumption of the ER-100 is not high considering that is a complete 8 channel mixer. The current absorbtion is: 160 mA (+12 VDC, with the maximum level on the headphone), 100 mA (+12 VDC no headphone) 60 mA (-12 VDC) These values are totally compatible with the Eurorack power supply modules.